On a related note, if you have just started learning Java, it's always better to use a companion book. This will improve your learning and you will learn more things in less time. You can use Core Java Volume 1, 9th Edtion by Cay S. Horstmann as core book to learn Java. 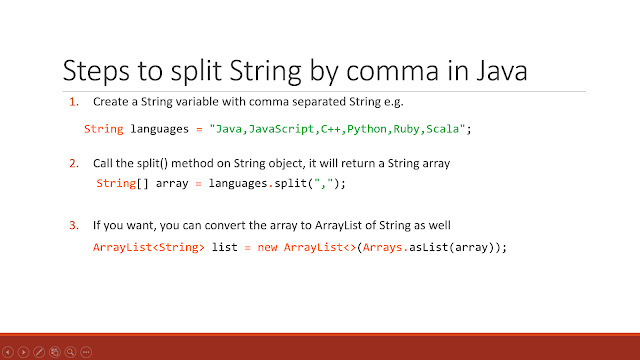 Let's see the example to split a comma separated String in Java now. Here is our sample Java program to demonstrate how you can use the split() method of java.lang.String class to break a CSV string into words. In our example, we have a String where programming languages are separated by the comma. We will convert this into String array and if you want to convert it into a list, you can. Since String is immutable in Java, you can not modify the original String. Any modification will result in a new String object. This is, even more important, when your String contains leading or trailing space, the trim() method will return a new String. Make sure you call split() method on that String, rather than on original String as shown in our program. * Java Program to split String by comma. // String where words are separated by comma. // space on first and last word. System.out.println("CSV String with leading and trailing space: "
You can see that we have first got String array returned by split() method after splitting a comma separated array. Next, we have converted that into an ArrayList. 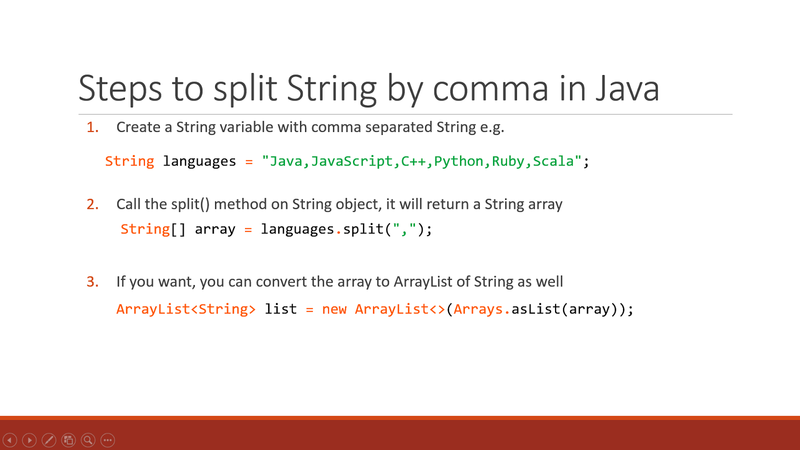 That's all about how to split the String by comma in Java. You can further convert the String array returned by split() method to create an ArrayList as shown here. You should also remember to use the trim() method to remove leading and trailing whitespace from the String before splitting, to avoid individual words starts with space or ends with space as shown in the second example. What about programming for the interfaces? That's better, you should always do it. Glad to hear that Khamis. Cheers ! !